Jo Thornley, head of brand and partnerships at Dynamis stresses that putting your property on the market should be approached as a process rather than an event. The decision to put your hotel on the market should be far more of a process than an event. That’s because wanting to sell in a hurry leaves you at the mercy of market forces, whereas setting your own agenda leading up to a sale is bound to give you far more control over the eventual outcome. Your aim should be to present your would-be buyers with a well-run, profit-making business operation. So, you may need time to achieve your objectives. Those buyers are most likely to be very interested in the overall hotel experience from a guest’s perspective, which in turn suggests you also should make that a particular focus. Ensuring you secure lots of positive approval from your guests has many strands: There is, for instance, the question of amenities for comfort and convenience. So, do you have Wi-Fi in all your rooms? And is the coverage efficient and reliable enough for the needs of business visitors? Your hotel should also have a social media presence, which is sure to be consulted by any prospective buyer and his team. That means you must have a system in place which gains you a regular flow of meaningful and positive reviews and ratings which give enough insights to paint a picture of what your clientele enjoys and are happy about. If that information correlates well with your booking figures, then you are well on your way to producing evidence of a business in rude health. Apart from ensuring your hotel premises are attractive and in good repair, which will not only create a good first impression but once again impact positively on your guest bookings, buyers will also be interested in the abilities of your staff team. With a sale in mind, it is wise to remove yourself from any crucial role in the day-to-day management of your business. If it can be clearly demonstrated that your business can operate profitably without you at the helm, that in turn will increase the potential investment value of your enterprise, making it more attractive to any new owner. When performing their own pre-sale due diligence, a new buyer’s team will wish to see comprehensive trading records. As part of their due diligence and assessment of the value of your business, they are sure to question the pattern of seasonal bookings, advance bookings, regular repeat bookings and returning visitors, as well details of any links you may have with local or national partners which could influence your reservations. That means, of course, that you must be fully conversant with the reasons for those trading peaks and troughs to avoid arousing any unwarranted suspicions. 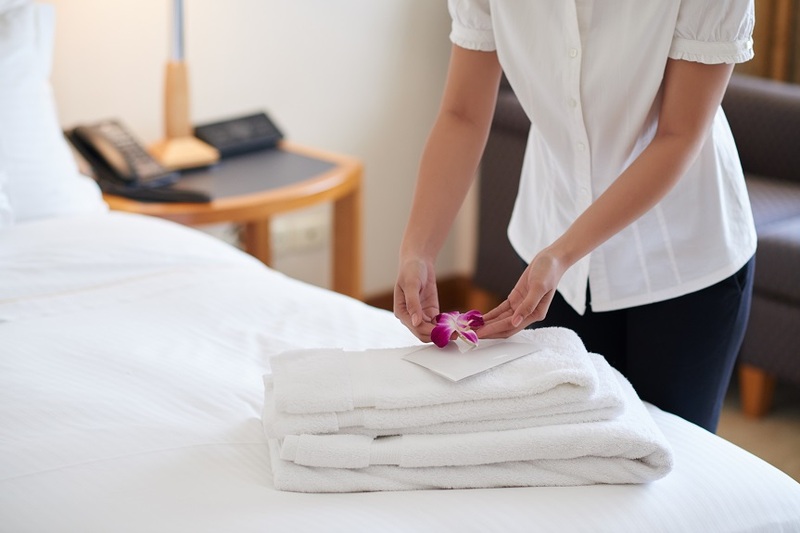 As well as looking stylish and welcoming, your hotel facilities must, of course, be spotlessly clean. However, for the hotel trade hygiene is also a legal requirement which is subject to inspection and advice about upgrades. What goes for kitchens and restaurant areas also applies to fire-safety inspections and compliance with employment legislation – not forgetting that utilities such as gas, electric and water each have their own regulatory demands. Even though compliance is a vast subject in its own right, demonstrating to potential buyers that your hotel is well run, also means being able to show you are fully up to date with these regulations and licensing requirements. For many owners planning to exit the business there is a temptation to ease back on your workload, especially when you have been fully occupied with the demands of getting your business into good shape. Unfortunately, any drop-in standards of service can quickly come to the attention of potential purchasers, who may then exploit the facts for their own purposes in an attempt to drive down your asking price. So, it really must be business as usual, and don’t take your eye off the ball as you lead up to any potential sales negotiation. Preparing your hotel for sale inevitably involves an immense effort, but it will be extremely rewarding to know you can pass on a business which is still just as highly regarded as it ever was. And in addition, the whole exercise will have a very pleasing effect on your chances of achieving the sales outcome you desire.